With all the responsibilities and obligations your family has, taking care of your carpet is one chore that can get away from you. But even if the carpet doesn’t look dirty, skipping a few vacuuming sessions isn’t a good idea. 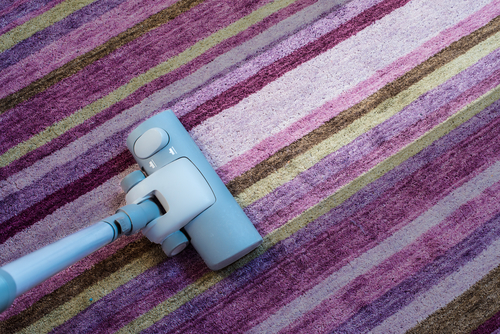 Regular vacuuming is essential to care for your carpet, and adopting a handful of other cleaning habits can maintain the look and extend the lifespan of your carpet. Carpets accumulate dirt, dust, particles, pet hair, pollen, insect husks, mold, and so much more on a daily basis. While carpeting is an excellent way to muffle sound, cozy up a room, and help allergy sufferers in your home, it is also a well-established place for gross stuff to take up residency. Follow the vacuuming equation. Ideally, you should vacuum once a week in high-traffic areas for every resident of your home (including pets). Family of five, plus two pets? Vacuum every day of the week. Tackle stains and spots immediately. Carpet stains, soils, and spots are all different, with varying degrees of difficulty regarding removal. One thing they have in common though? You’re more likely to eliminate carpet stains if you tend to them immediately. Invest in professional carpet cleaning. Carpets should be cleaned professionally at least once every 12 to 18 months. Consider a pro carpet cleaning more often (every six or nine months) if you don’t vacuum regularly, or if you are dealing with any soiling or spots that just aren’t coming out with regular vacuuming. Use a welcome mat. Don’t just set one out for show, really wipe your feet on it and ask guests to do the same. The mats trap soil before they have a chance to do too much damage to your carpet. Remove your shoes before walking on carpet. Again, ask any visitors to your home to also remove their shoes. The amount of dirt and debris that comes into a home on the bottom of a shoes is staggering, and you can’t even see most of it, but that doesn’t mean the carpet isn’t harboring it! Cover high-traffic areas. Simple, machine-washable area rugs can save your carpet from abuse. Even if people don’t remove their shoes, these throw rugs latch onto at least some of the undesirables coming into the house. It’s also a good idea to choose a vacuum that is approved by the Carpet and Rug Institute to ensure that your carpeting is getting the best care possible – you want a machine that doesn’t just appear to remove surface dirt, but actually removes it. Having your carpet professionally cleaned once a year prolongs the life of your carpet, protects indoor air quality, makes it easier to maintain your carpet, removes tough stains, and improves the appearance of your home. Contact Nu-Way Carpet Cleaning in Macomb, Michigan, to schedule your next carpet cleaning for your home.